VIRAL VIDEO: De Lima's concert inside Bilibid? MANILA, Philippines – Senator Leila De Lima is pressed again on another issue as a video of her performing in a concert allegedly held in Bilibid went viral on Thursday. Facebook page “Duterte and Bato Supporters” posted a video last night, August 31. Former Department of Justice (DOJ) Secretary is seen singing a popular song “Careless Whisper” in a room with a concert-like ambience. 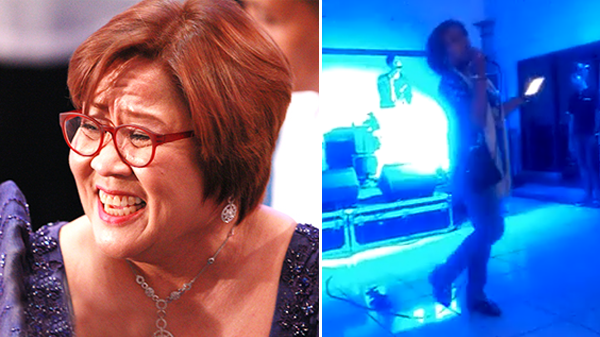 In the video, De Lima—with microphone in hand—is backed up with a band as she wholeheartedly sang to the audience. The senator is swaying her hips as the audience sings with her and chants. “Hayop talaga tong si Leila Balyena, todo tanggi sa mga pinagagawa nya pero sobrang daming ebidensya ang magpapatunay na protektor sya ng mga druglord, nag concert pa sa bilibid amp*ta! ikaw na may talent... share natin 'to mga ka-DDS para madakip na ng mga pulis at makulong kagad!” (This Leila Whale (De Lima) is a beast! She always denies all her wrong-doings but there’s too many evidence to prove that she’s the protector of the druglords. She even held concert in Bilibid for f**** sake. You’re the talented one…Let’s share this Duterte-Bato Supporters so the police can arrest her immediately!) the Facebook page said in the post. The video went viral immediately after it was posted. As of now, it has 15,000 plus likes/reactions, 79,000 plus shares and has been viewed 1.4 million times already. The comment section of the video too gained quick hatred and judgements by netizens, lauding negatively on De Lima. But some commenters warned to think twice and not be quick to judge. As of press time, De Lima has yet to answer allegations from the viral video. RELATED: Senator De Lima: "Truth is on my side"